Let me start by saying that I have been go far too long. After working my tail off as we say and I've been diverted away from my collecting interests I had a client present me with the following medal. I have never owned one quite like it. I know there are table medals of the same award struck in bronze. However, I have not seen one with a suspension and ribbon and this one is struck in Silver. Any comments are greatly appreciated. It certainly is good to be back and I look forward to rekindling friendships. the ring and the ribbon seems to be selfmade later? Not sure Uwe... The mystery continues my friend. I don't know if I would exactly call it a "Party Shooting Award". 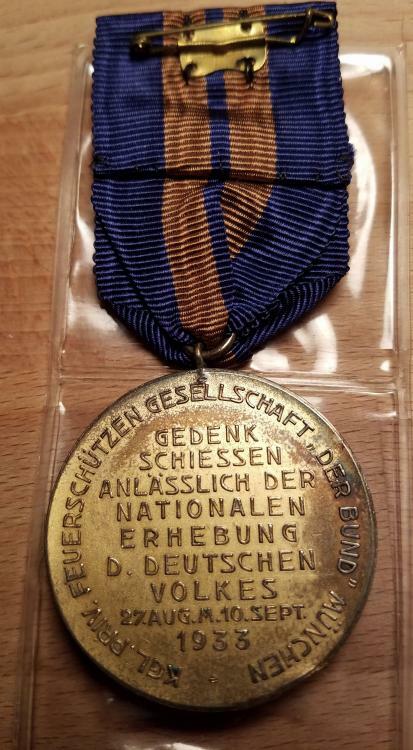 According to the text on the reverse, the medal was to commemorate a shooting event held in August-September 1933 by the Royal Private Fire Protection Association in Munich in celebration of the National Awakening of the German People (the Nazi takeover earlier in January). The organization chose to put the image of the new Chancellor on the obverse. So there is no connection to the NSDAP. I apprecitate your clarification and duly noted. Thank you very much. Interesting piece. I can only add that it was originally designed by G. Weber, a well known medalist of the period. I think Uwe might be right about the medal being re-purposed for a ribboned piece. Those I have seen in the past were non-portable, unless of course they made both varieties. The size of the non-portable ones is 40 mm. What is the size of this one? I thank you for your interest. This medal is 48mm in diameter. I agree it looks as though a previous owner has applied a small amount of solder to attach the ribbon.